Looking for a little “me moment” after the end of a long day? Treat yourself to this Easy Pear Crisp with Vanilla Bean Frozen Yogurt (that makes just enough for two and only calls for 6 ingredients) and unwind! I mentioned several times over the past few weeks that one of my new year’s goals was to be more connected. Connected with the people I love… not distracted. Connected to my job… giving it my 110% when I am there. Connected with my loyal blog readers. And just overall, building deeper, more personal relationships with the people in my life. However, I realize it is equally as important for me to connect and reconnect with myself, my soul and personality. You see, that is one of the main reasons I chose “connect” as my 2015 focus word. Last year I felt so disconnected from myself. I wasn’t unhappy. Actually, not at all. But I knew something was lacking. What was lacking, was doing things just for fun (that wasn’t “penciled in”) with friends and family. But most importantly, doing things just for me is what was missing the most. Yeah, I am blessed that I get to do my dream job every day, but even if you are doing what you love, I realized that I still needed to take a break…. To meditate, to recharge my creative juices, run off stress. So slowly, yes, even if it has to be inked in red on my daily agenda, I have been making time just for me. Time away from food and blogging and photography (even though I could do that all day and be as happy as a clam), time spent doing other things to clear my head and strengthen my heart. One of these game changing activities has been writing in a journal. No not, in the “Dear Diary” sort of way, but more like I have a big journal where some days I write and other days I just doodle. Sometimes it is serious, like what scares me, and other days it is my current favorites (favorite TV shows, or books,or quotes, etc.) and sometimes I even just cut and paste things into my journal (taking me back to the easier days of my youth). I really have come to love my daily journal writing, because even though this blog is like a journal, my personal, handwritten journal is something that is just for me. Plus, it gives me an opportunity to unplug or disconnect from this computer, the TV and the noise around me. Oh and another perk of journal time? I get to enjoy a cup of coffee (if I am writing in the morning) or a sweet treat (if I am writing at night). One of my favorite “go to” nightly treats is ice cream, however, I know that despite my good efforts, I should probably not have ice cream every night of the week. That is why I was happy to discover these new ice cream inspired yogurts from Müller® on my latest trip to Walmart. These yogurts come in a variety of flavors, like Vanilla Bean and Strawberries and Cream, and seriously taste like my favorite frozen treat! 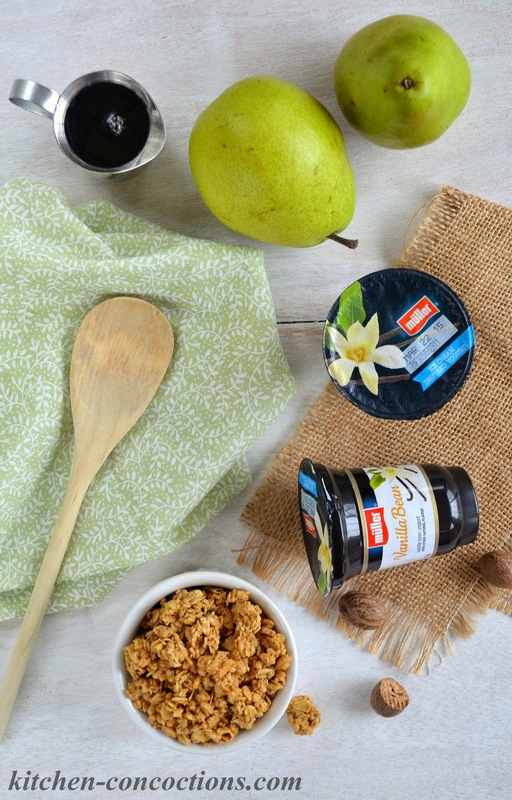 Even though these yogurts are the perfect late night snack or indulgent breakfast, all on their own, I decided to pair my favorite flavor with a simple dessert, for an extra special treat! 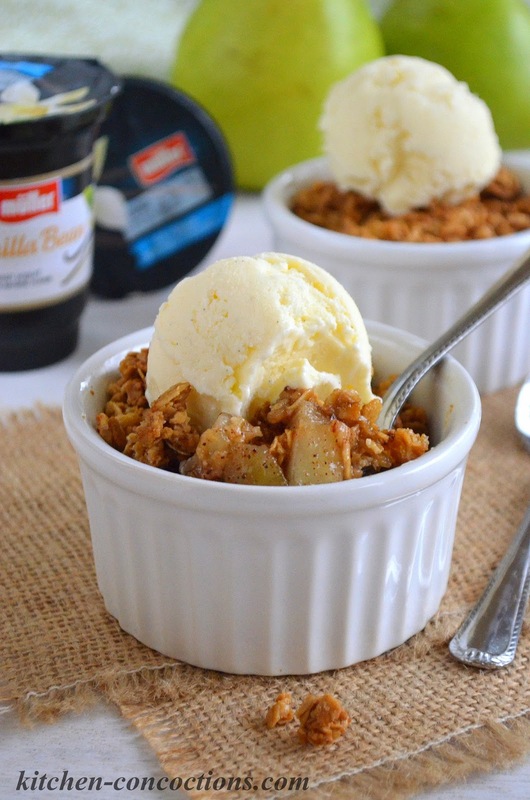 This Easy Pear Crisp makes just enough for two and pairs beautifully with a scoop of frozen Müller® Ice Cream Inspired Vanilla Bean Yogurt! Go on and whip up a batch all for you, then go and enjoy it doing something you love! How do you celebrate a little “me moment”? 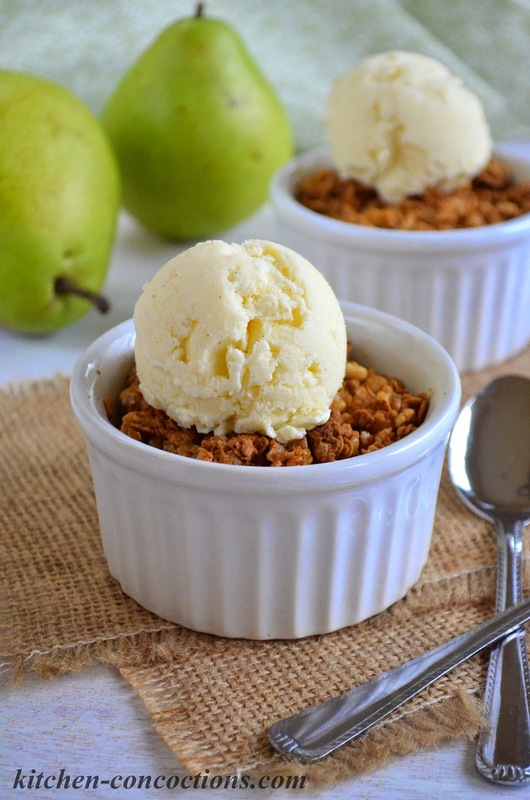 An easy, small batch pear crisp topped with crunchy granola and creamy vanilla bean frozen yogurt. Meanwhile, preheat oven to 350 degrees F. Grease two large (8-ounce) ramekins with butter or cooking spray. 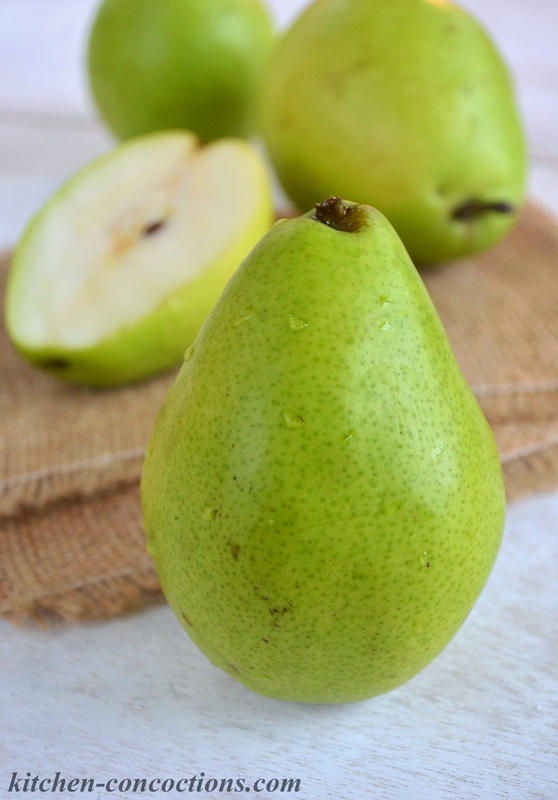 Divide diced pears evenly between prepared ramekins. 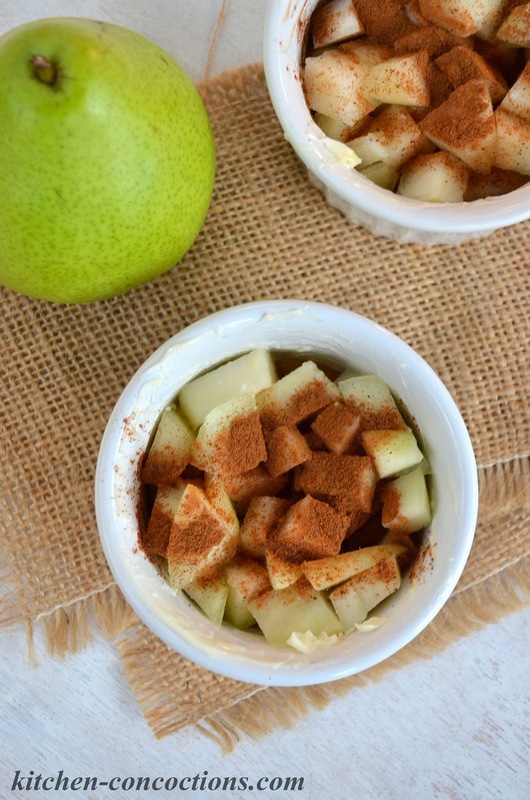 Drizzle one tablespoon maple syrup over pears in each ramekin; then sprinkle ¼ teaspoon nutmeg and/or cinnamon over pears. Evenly divide granola between the two ramekins, completely covering all of the pears. Pour melted butter evenly over the top of the granola. Bake in preheated 350 degree F oven for 15-20 minutes or until crisp is hot and bubbly. Serve immediately topped with previously frozen vanilla bean yogurt. *NOTE: To save time, crisp can be served simply with one container refrigerated Müller® Ice Cream Inspired Vanilla Bean Yogurt (which is equally delicious!). Love Muller? Visit www.Mullerquaker.com to sign up for their mailing list and receive the latest news and offers. As a thank you, you’ll also get a coupon to use toward your next purchase! Then attend a special demo of the Muller Ice Cream Flavored Yogurts at select Walmart locations on March 14 to check them out. 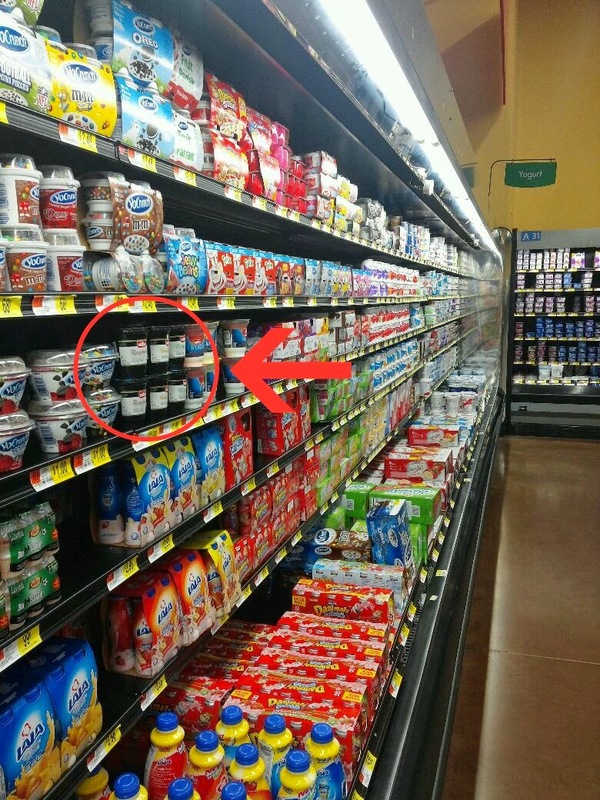 While at Walmart, be sure to stock up on all your favorite Müller® Yogurts, which are currently on rollback for $.88! For more information, visit Müller® online or follow them on Facebook and Twitter!